Detective Jack Saxon (Wings) is a cop who shoots first...and doesn’t bother to ask any questions later. Some people in his department don’t approve of his methods, but he gets results. That’s why Barrett (Black) hand-picks him to break up a counterfeiting ring and bring the culprits to justice. His partner Burt (Palese) is a good guy, but unlike Jack, is afraid to fire his gun. This odd couple of sorts must get to the truth about the gangster Miller Richardson (Z’Dar). As it turns out, Jack and Miller were in Vietnam together and have a deep history. But they ended up on opposite sides of the law. Try to imagine a Luc Deveraux-Andrew Scott (Universal Soldier series)- sort of relationship, but instead of later being turned into SuperSoldiers, they fight it out man-to-man in the streets of L.A. Through it all, Jack must keep his relationship with fiance Dorothy (Elaine Pelino) afloat. Can he do it? 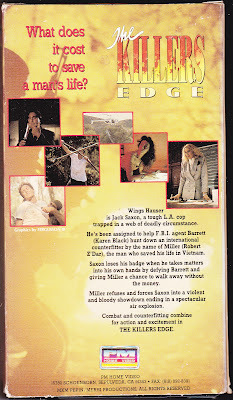 The Killer’s Edge is what would happen if Joseph Merhi directed To Live and Die in L.A. (1985). It’s cops vs. counterfeiters, PM style. And while Merhi would improve to a higher level later in his career with awesome classics like Zero Tolerance (1994), Last Man Standing (1996), and The Sweeper (1996), The Killer’s Edge is like laying the groundwork for those later masterpieces. It’s not quite up to those titles because his talents were still improving. Looking back from today’s standpoint, you can see his evolution. This could be a sequel to the same year’s The Art of Dying - Wings plays a cop named Jack who seems to have some mild issues with women. He plays by his own rules, and they even have the same catchphrase: “Owwww!” Since we don’t know for sure, we’ll just pretend both movies are chapters in the ongoing tale of Jack Saxon. It’s great to see Wings interact with Robert Z’Dar. Truly it’s the clash of the titans, and it’s enjoyable to watch their interplay. We get to see Wings struggle on ice skates, but we get Z’Dar with a rocket launcher. So it’s pretty much a wash. While The Killer’s Edge wasn’t shot all that long ago, there are plenty of cool, nostalgic things in the movie that don’t exist anymore: people smoking in government buildings without a second thought, they have pagers that they must respond to by using the nearest pay phone, there’s a reference to how the U.S. dollar is “strong”, and there’s even a Fotomat in a parking lot. Remember those little huts where people used to get their film developed? Truly those around in 1991 didn’t know the fool’s paradise we were living in. Especially when we had Jack Saxon to protect us all. 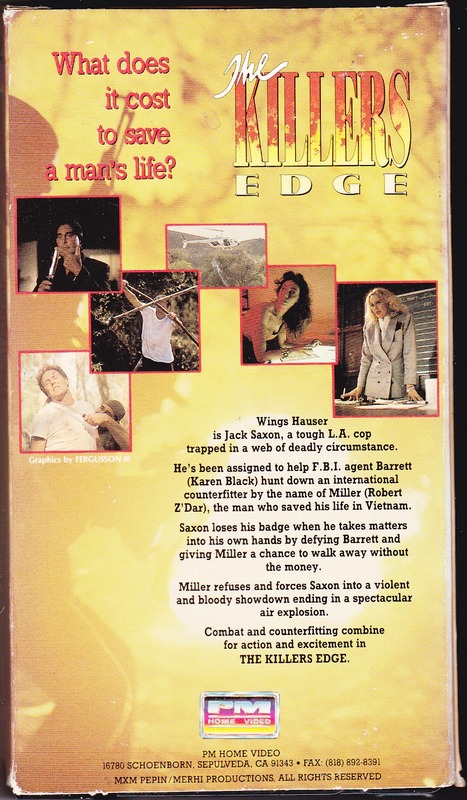 The Killer’s Edge is a solid, quality DTV film that signaled the further quality to come from PM. Also check our buddy DTVC's review! 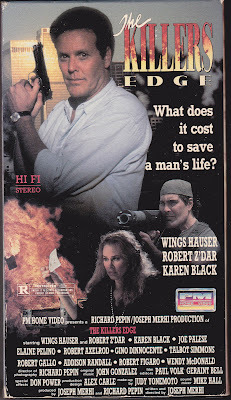 Ah man I'm way behind with my Wings Hauser movies - where do I start? What's your top 3? Start at the beginning of his career with Vice Squad and then probably L.A. Bounty, and then maybe Deadly Force. It's hard to go wrong with Wings, he usually lifts the material. This is frickin' great. Really dig your reviews. Fotomats? Makes me feel a hundred! Haha, Thanks! We really appreciate the kind words. This one was decent, but IMO not one of Hauser's finer moments, the pacing was a tad sluggish in parts and it didn't really get going until the last act. P.S. I started a petition, if you could sign it i'd really appreciate it. 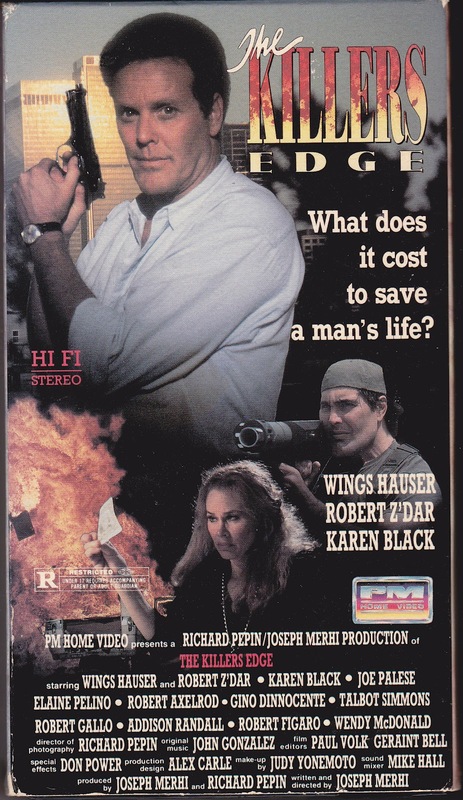 Robert Z'Dar and Wings Hauser? Wow, such an awesome couple. It seems good material. Great review! Venom: Definitely agree there were some slow moments. Also signed the petition, buddy! Nof Low: Thanks! They are a good team. They should have made more movies together.